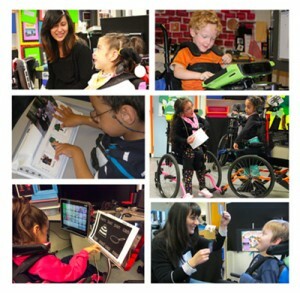 The Bridge School provides high quality academic and social experiences that encompass a broad range of knowledge, skills and abilities across all subject areas with concurrent emphasis on supporting students’ use of assistive technologies, development of communicative competence with augmentative and alternative communication (AAC) systems, and attainment of self-determination skills. 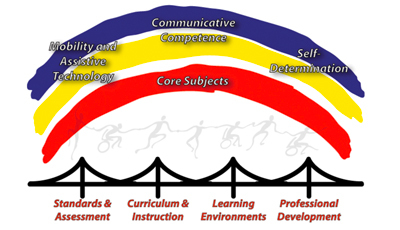 Using research as a resource to guide our practices, we adapt, customize, implement and document intervention approaches, curricular activities, and instructional supports and strategies that best address the needs of our students in The Bridge School context and beyond. At The Bridge School, we believe that communication is a process of making meaning through shared engagement and interaction. We all have the desire to create meaningful connections with others, to learn and to share new knowledge, to talk and engage authentically with the important people in our lives. Communicative Competence is “the ability to communicate functionally in the natural environment and to adequately meet daily communication needs” (Light, 1989). In order to develop communicative competence, our students with complex communication needs (CCN) and severe speech and physical impairments (SSPI) need specialized instruction to learn skills that enable them to communicate effectively for a broad range of purposes. 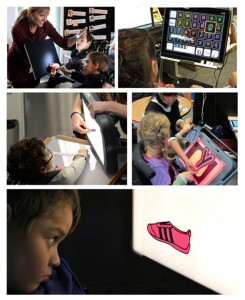 At The Bridge School, they learn to use mainstream technologies and alternative and augmentative (AAC) systems and strategies to bypass, overcome, or augment their natural speech. Proficiency communicating with these tools and strategies fosters access, participation, motivation, and achievement across all curricular areas and life domains. Instruction in developing communication competencies is infused within the context of ongoing academic and social activities at The Bridge School. 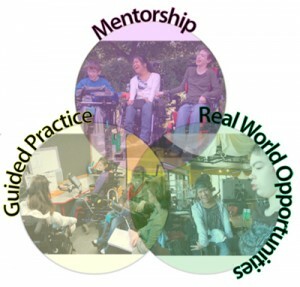 It is essential for students with complex communication needs (CCN) to develop the skills and attitudes associated with self-determination in order to have direct influence in matters that affect the quality of their lives. The Bridge School Self-Determination Program provides students with the necessary tools and supports to become causal agents in their own lives through informed decision-making, thoughtful planning and persistent action to achieve their goals. Cortical Visual Impairment (CVI) is a major cause of low vision in children in the developed and developing world due to increasing survival in pediatric and neonatal care (Phillip & Dutton, 2014). CVI is also the most prevalent visual impairment for students at The Bridge School. Our students with CVI and Severe Speech and Physical Impairment (SSPI) have challenges that require specialized and appropriate vision accommodations that support them in meeting their educational potential. Meeting the educational goals necessary to provide Bridge School students optimal opportunities for participation in areas of communication, education, and literacy, requires assessments and interventions that specifically address the unique needs of our students with CVI. 5/25/2018 — The Bridge School’s Cortical Visual Impairment (CVI) website is live!